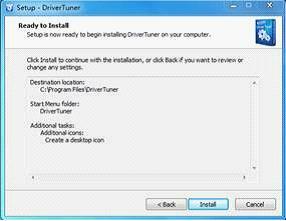 DriverTuner is a full-featured and easy-to-use driver-updating software which could help you download almost all your computer drivers for your PC, fix driver problems and keep them updated. 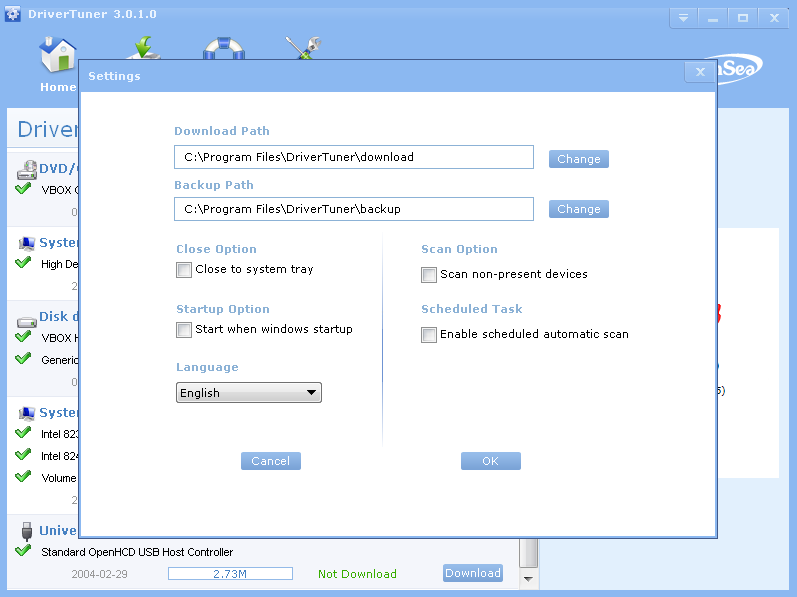 It is an advanced driver-updating software that supports over 20,000, 000device associated drivers. Based on a comprehensive database, it will check the entire system of your computer and detect the device drivers your hardware and software required. 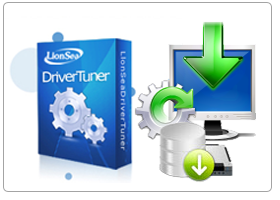 DriverTuner is compatible with all Windows operating systems such as Windows® XP 32-bit, Windows Vista® 32-bit and 64-bit, and Windows® 7 32-bit and 64-bit operating systems. If you have a missing, outdated, or corrupted driver, DriverTuner can help you fix driver issues in just a few minutes! It can also help you fix system problems with new drivers quickly and keep your PC in a healthy state. DriverTuner can help you update the old drivers with the latest drivers for your computer. You can download the drivers with just a single click. It will boost your PC and maximize your PC performance! DriverTuner Machine Intelligence identifies your specific computer to provide you with the most accurate and latest drivers available. 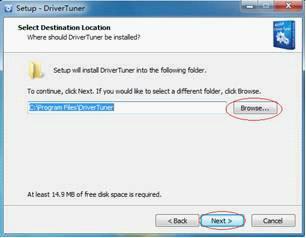 DriverTuner excels in its easy-to-use interface. Any driver issues can be fixed with a few clicks of your mouse. It is easy enough for computer novices to figure out in a flash. Based on a huge and comprehensive database of more than 20,000, 000 driver entries, DriverTuner supports drivers for almost all major computer hardware and device manufacturers such as Dell, HP, Lenovo, Samsung, Toshiba, ASUS, Nvidia, Intel, Realtek, Brother, EPSON, Compaq, Gateway, and so on. It can fix driver issues for your motherboard card, chipset, graphics card, audio& sound card, video card, monitor, printer, webcam, network adapter, router, USB, bluetooth, firmware, etc and keep the drivers updated. 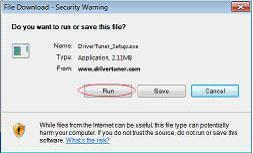 DriverTuner is compatible with all versions of Windows operating systems such as Windows 7, XP, Vista, 2000, 2003, 2008, 32 and 64 bit. Select the desired language and click the "OK" button. 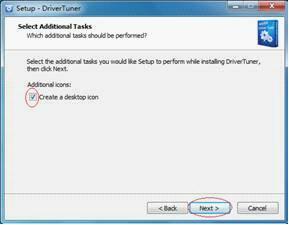 Follow the instructions to complete the installation of DriverTuner™. 1. On the "Setup-DriverTuner" interface, click the button [Next] to continue. 2. 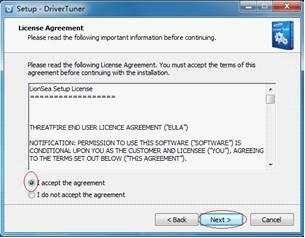 On the "License Agreement" interface, tick "I accept the agreement" and then click the button [Next] to continue. 3. On the "Select Destination Location" interface, click the button [Browse…] to choose the destination location, and then click the button [Next] to continue. 4. On the "Select Start Menu Folder" interface, click the button [Browse…] to choose the start menu folder, and then click the button [Next] to continue. 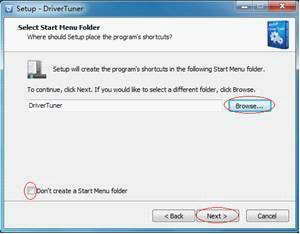 Note: If you do not want to create a start menu folder, you can tick "Don't create a Start Menu folder". 5. On the "Select Additional Tasks" interface, you can choose to tick "Create a desktop icon" to create an icon on the desktop, and then click the button [Next] to continue. 6. On the "Ready to Install" interface, click the button [Install] to continue. 7. 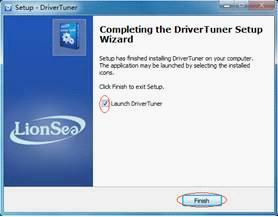 On the "Completing the DriverTuner Setup Wizard" interface, click the button [Finish] to exit the set-up and launch DriverTuner. Note: If you do not want launch DriverTuner, you can also choose to untick "Launch DriverTuner". 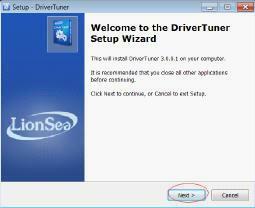 Drivertuner is an advanced driver-updating software that supports over 20,000, 000 device associated drivers. It is a full-featured and easy-to-use driver-updating software which could help you download almost all your computer drivers for your PC, fix driver problems and keep them updated. Based on a huge and comprehensive database of more than 5,000,000 driver entries, DriverTuner™ supports drivers for almost all major computer hardware and device manufacturers DriverTuner™ excels in its easy-to-use interface. Any driver issues can be fixed with a few clicks of your mouse. It is easy enough for computer novices to figure out in a flash. So it wins the praise of numerous users. I was so incredibly pleased with the results that I decided to buy DriverTuner™. I converted 5 videos with Video Converter. All of them are in high resolution. Thanks.It it the best software I have ever bought online. with the latest drivers, especially my old video driver. Now the game is running more smoothly! Wow! What a driver fixing and updating program! HAHA! within 2 minutes! Thanks! It is a terrific driver fixing and updating program!!! tell you sincerely that none of them will match DriverTuner™. It is the best by far! best in the market - very easy to use and capable of yielding superb results. Everyone who wants to fix and update drivers is recommended to use it!